This is where the printer’s utilities you just downloaded were installed. 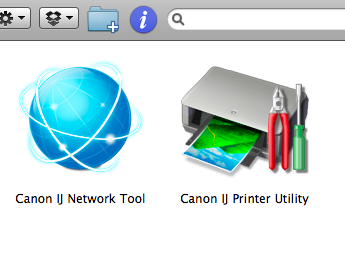 6- Double-click on “Canon IJ Network Tool”, it’s going to scan for printers. Since the printer is not yet added to the network it won’t find anything. The goal is to add the printer first on your network, and then on your computer in the system preferences. 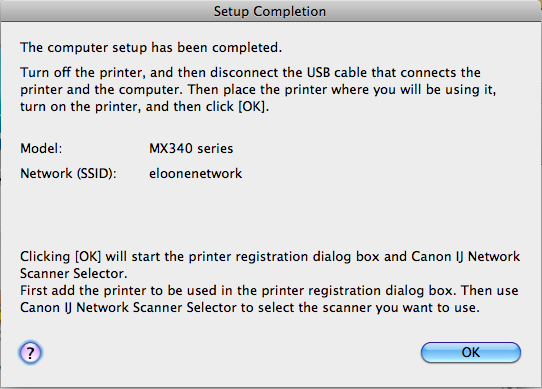 A dialog box will open saying that the printers connected via usb were not found. Just follow the instructions of the dialog box. 6.1- Connect the printer to the computer with the usb cable provided with the printer. Follow the paper guide to see how. 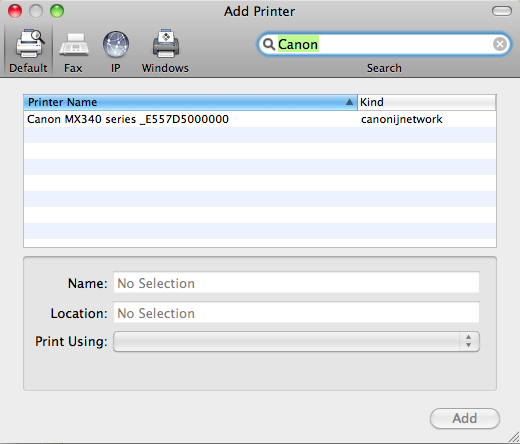 Make sure the printer is on and click “Update” in the “Canon IJ Network Tool” dialog box. If it’s still not detected, turn off and on the printer. It might take few seconds before the usb connection is detected. To see that the printer is active, make sure the printer’s screen displays “100% A4 Std Ordinary paper” etc. (the standard text when the printer is ready to print) then click “Update” again. 6.3- Another dialog box should open prompting you to add a printer. Go to the default tab and if the Canon printer doesn’t appear type “Canon” in the search box. Once found, select it and add it. Try to print, it should work. I hope it helps even if I couldn’t capture all the screenshots of the different steps. I couldn’t find much help on the Internet, the printer might be old or people usually have a working CD reader… But still, the setup software should be on the Internet by now, yet I didn’t find it on Canon’s page. What else is the Internet for if not to free ourselves from CDs and all that physical but digital stuff? By the way, the getting started guide was very messy, printers are always so painful to set up, there is always a problem. What would be a world where printers were intelligent and fixed their problems alone? I’m glad it helped you, thanks for your comment 🙂 it’s true there is not much information on the subject on the web. I never get over the kindness of people like you! I’m so grateful for your help on this issue. I had been trying for ages to connect using the software that came on the CD and it just wouldn’t work, but your instructions worked like a dream! 🙂 i love your comment! Thank you so much for the information. I haven’t been able to set up my wireless connection since I bought the printer almost a year ago. I tried everything in the manual after the first installation didn’t work; no luck. Now finally success. Thank you so much! Finally working with NO WIRES! Outstanding!! Just what I needed, yet unable to find on the Canon site. Thank you very much! You’ve saved me a bunch of time. Hello , I am having trouble setting up my wi-fi on my canon mx340 because my password contains letters and I don’t know how to get the numbers converted into letter by number..can you help me? Hi, having a password containing letters shouldn’t be a pb for setting up the wifi, you can enter the password in clear mode to see exactly what you’re typing. Thank you as well. This article was the best advice on this subject. Like other posters I too did not use wireless for over a year now with the help of your tutorial I connected both my wife’s and my computer! My MX340 never worked using wifi with my old MBP, and I was determined to get my brand new MBP working… So much searching around for drivers, bits of software etc — your post finally helped me, and so simply. Unbelievable!! I was successful using your helpful directions and screen shots. I cannot thank you enough. I’ve been using the USB cable for over a year. I was able to get my wireless finally working which was a great relief but (and I don’t know if this is just a coincidence or not) now my computer is doing some strange things. Perhaps I did something wrong. Be careful out there if you are only nominally tech savvy (like me), things can go awry. I must say that without this info though I wouldn’t have gotten this far so thank you for that. Now I just have to figure out what else is going on. Still helping people in 2014. Had this printer given to me with only the Windows CD. Your instructions worked perfectly! Thank you. Thanks so much! I clicked on the link you provided to download the drivers for the printer, and was led through the set up process to connect my printer wirelessly. I had lost the installation CD, and you were a lifesaver. Canon has made the process easier since you posted this in 2011. Still not hassle free, but after a few minor difficulties, voila! I’m connected! Thanks so much for this. It’s crazy that it is 2014 and it is that much work to get my printer to work because my network name and password changed! Thank you Thank you!!! Our printer decided to fo offline and none of the computers would print. This worked!!! Glad it helped. Thanks for letting me know about this link! link worked perfectly for new printer Pixma MG3560 which came with wrong CD Rom. Followed your straight forward instructions.. printer connected & wireless is working.. very grateful, thanks a bunch!